That’s my motto for LA BEER Week. Just Try it! Try a new beer this week. Something you wouldn’t normally drink and maybe you will love it! So LA Beer Week which is more than a week is up an running with events all over the city. Check out the events http://labeerweek.com/event/. Or if you frequent a favorite bar Im sure something is going on. Today I spent Day 2 of LA Beer week at two of my FAVORITE places. Story Tavern http://www.storytavern.com in downtown Burbank. And Tony’s Darts Away also in Burbank. http://tonysda.com/ Both places are huge craft brew havens. So I decided since it was super cloudy and a bit chilly today –by chilly I mean LA standards in September, so like 80– it seemed like Autumn was here. I have gone into Autumn kicking and screaming. I think part of it is because I have a school aged child now. Gavin is in 2nd grade. So when school is involved the end of summer is that much harsher. For him and for me. School means PTA involvement, stricter bedtimes and of course homework. You wouldn’t think homework in 2nd grade would be that tough. And its not, but as he gets older and the homework goes from coloring to real studies, and I realize just how much I have forgotten, or perhaps never learned. I will be the first to admit I may have spent too much time at Trojan football games and tail gates then in the classroom (college is wasted on the young sigh). So now I find myself answering his questions with a “well lets go look on the computer” or I nod when he says “is this something we need to ask Dad?”. I digress..so Summer is ending and its mid September which means Im ready for some new types of beers. Not the pilsners and lagers …although truth be told its LA in Sept. It will be 100 again next week and I’ll bust out a good “outside drinking beer”. But today since it was mildly cloudy I went for some darker beer choices. Our first stop was Story Tavern. 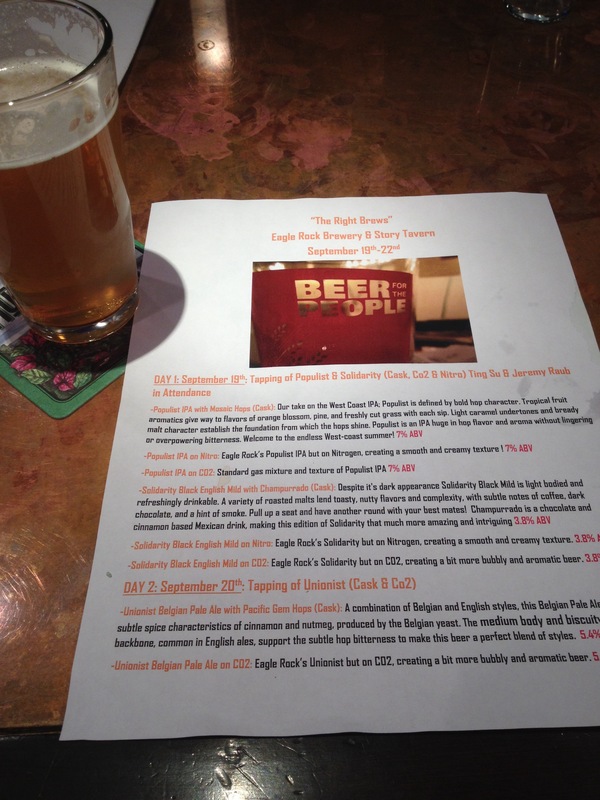 Lucky for us last night they had a Tap Take Over by Eagle Rock Brewery. http://eaglerockbrewery.com/page/beers I’m sure you know Eagle Rock but if you don’t They are the forefathers of Craft Beer in LA. They have fantastic beers and Mr Beerman and I are big fans. 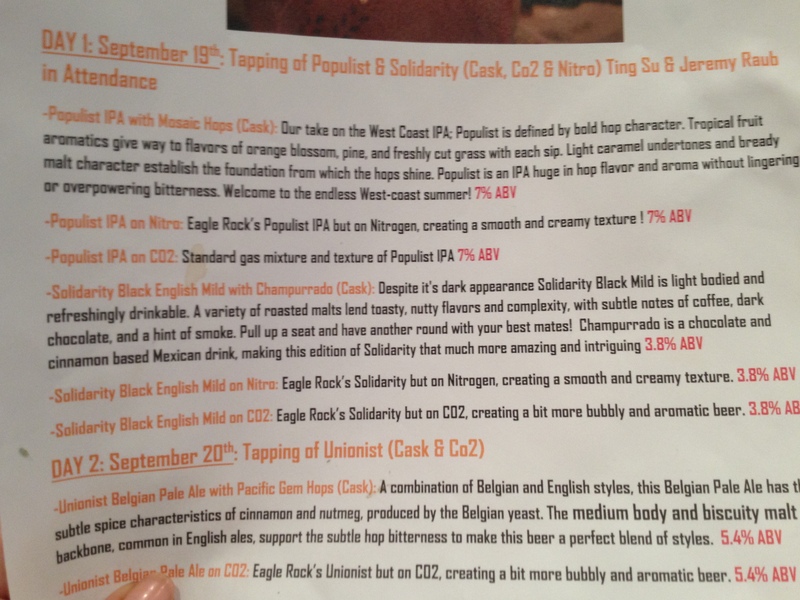 I was giddy to get the Revolution on tap. Now normally I don’t like an extra pale ale. But this one is so smooth and tasty. I have to recommend it. Even to my friends reading this who don’t normally venture into the Pale Ale or IPA world. From their site: “Extra Pale Ale (XPA) is a variation on American pale ale–bright and refreshing with a substantial hop presence. Light-gold in color, Revolution XPA’s subtle malt backbone and medium body balance it’s hop bitterness. Dry hopping delivers big hop aromas with the essence of nectar fruit, citrus, and freshly cut grass. As these assertive flavors recede a hint of bready malt rounds out the finish. Im still not on the Belgium bandwagon. So I passed, BUT I did find which I think was the greatest find of the day. Their Solidarity which is a good beer to begin with, a black mild ale, “”Mild” refers to an English-style beer that is malt-accented yet light bodied and low in alcohol. Depite it’s dark appearance Solidarity Black Mild is light bodied and refreshingly drinkable. A variety of roasted malts lend toasty, nutty flavors and complexity, with subtle notes of coffee, dark chocolate, and a hint of smoke”. But heres the thing, Story Tavern had THREE takes on this beer (the others had some different versions as well) they had the normal Solidarity, Solidarity on Nitro (which means creamer like a Guinness or Murphys) and a special Cask version made with Champurrado, mexican chocolate. Okay first let me explain. Cask is how beer drinkers used to drink beer, before the 20th century, far less carbonation it served without Nitro or CO2 and well a bit warmer than usually served. Ok this mexican chocolate addition is the freaking bomb! It was so good. And at 3.8% I could drink it all night. It wouldn’t fill you up and its low ABV makes it such a great beer. I hear it was a small batch so if you can get some do it. 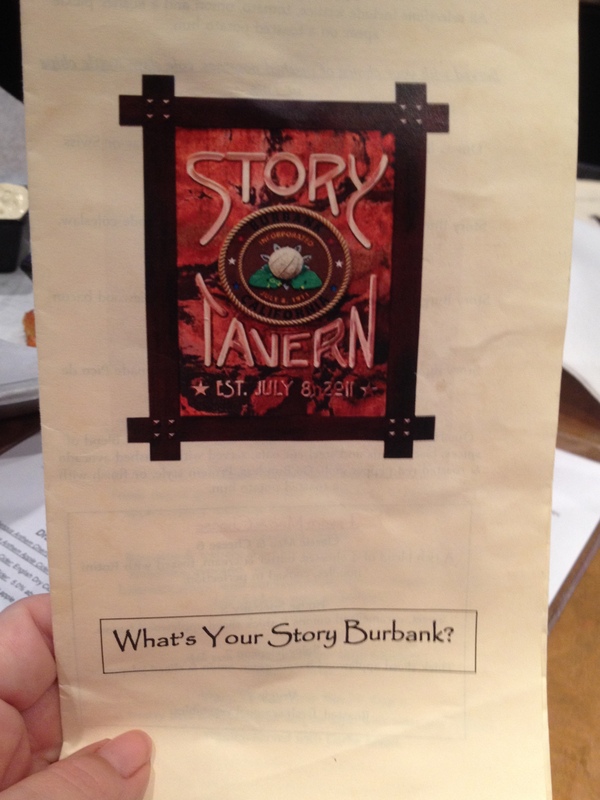 Run don’t walk to Story Tavern this week! My second stop was to Tonys Darts Away. Its sort of the go to place for Craft Beers. 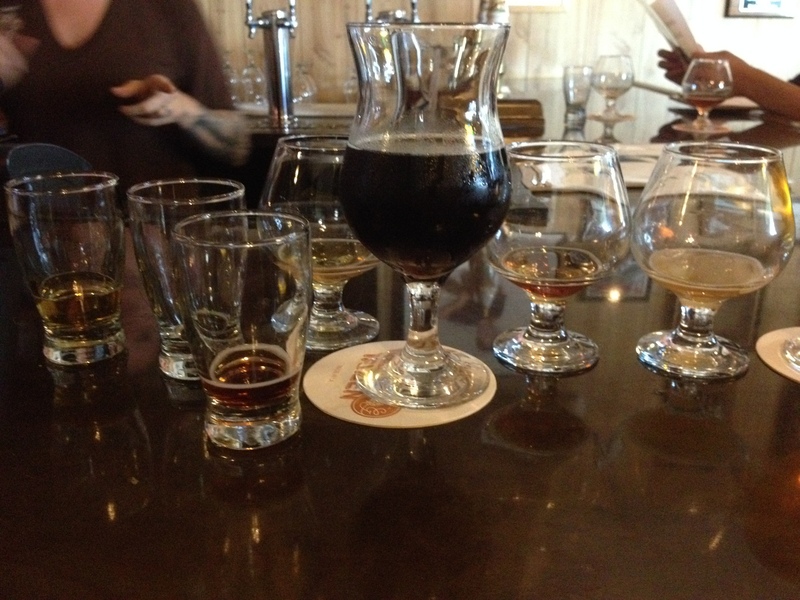 I ended up after several samples deciding on a Mocha Stout from TAPS. It was very tasty. I highly recommend. If you like a good stout and a chocolate coffee flavor this one surely fits the bill. 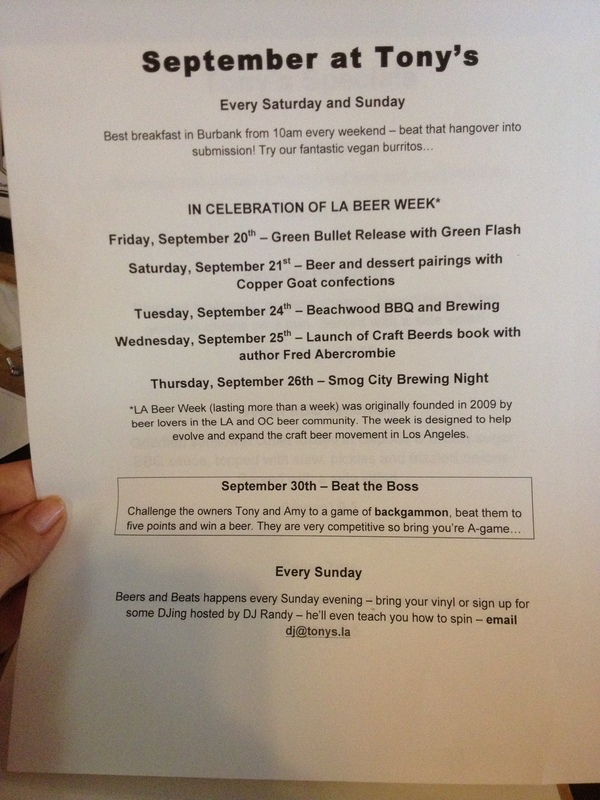 Tony’s is doing several events for LA BEER WEEK (see the pic posted). And just in general you should visit here if you want to try a good craft brew! Oh and order the home baked potato chips. You’re welcome. So my theme of the blog was to try something new. Even if you think you aren’t going to like it try it. I would have NEVER thought I would love a Mexican Chocolate Black Ale, but now I dream of it. You don’t need to order a pint, ask for a taste this week. Surely any server will hook you up. Maybe you will love a beer you never thought you would. It sort of reminds me of my aforementioned 2nd grader. He is horrible at trying new things. So when I want him to try something I said “remember the pumpkin bread”. He turned his nose up to orange bread last fall til he tried a piece. Now he thinks pumpkin bread is the greatest thing since well…sliced pumpkin bread. Speaking of Pumpkin…I’ll be on a quest this week to find some good Pumpkin Ciders and Ales to report back on. For now Happy Beer Week..and remember “just try it, you may like it!”. So I know I typically write about local places or CA brews. But you know from my posts that I’m a big fan of Kona. 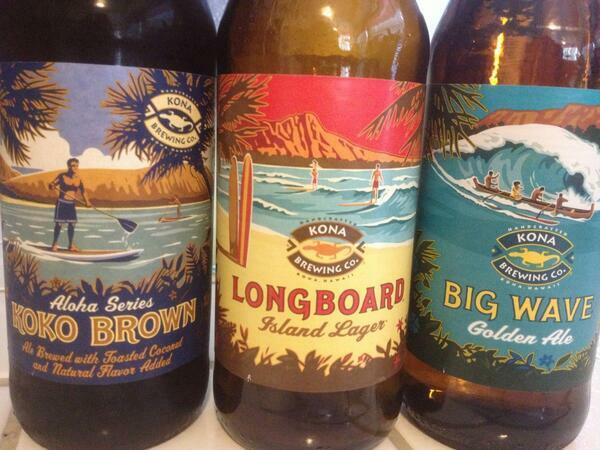 Kona Brewery is in Hawaii. I mean that right there its gotta be good right? What’s not to like about Hawaii? The beaches. The pineapple. The coffee. It’s just paradise. So why is it shocking that they produce some really delicious really drinkable beers? Before we embark on LA craft brew week which ironically starts 9/19 the day after my wedding anniversary 9/18 to Mr. Beerman I thought I would do a quick blog on our favorite outta state brewery. Ok back to the topic at hand…KONA! Kona has a great selection of beers. This is one of the few that we love. 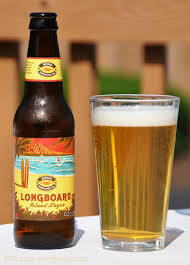 Let’s start with Kona Longboard. It’s a lager. If you like beer you more than likely enjoy lagers. Straight from the interweb: Lager is a type of beer that is fermented and conditioned at low temperatures. Pale lager is the most widely consumed and commercially available style of beer in the world. I like them cause they fit the bill as my favorite: “outside drinking beers”. But don’t be mistaken lighter doesn’t mean flavorless. Well in some cases it does but I won’t name names cause I have relatives who are employees in the beer industry in Wisconsin. I’ll stop there…. Back to lagers. They’re light but with a body and flavor. And this is hands down one if the best out there. My personal home tap has had more kegs of Longboard in it than any other beer. Partly because Mr Beerman and I love it but partly because so do most all our guests. It appeals to the masses, from the “sometimes” beer drinker who comes to our BBQs to my home brewing award winning friend Paul. And lets call this beer the “paul” of the 4pk. Ok so…Golden Ales were developed in hope of getting folks away from drinking lager and moving them more toward cask ales. Its similar to pale ale yet there are some notable differences- it is paler, brewed with lager or low temperature ale malts and they are served in colder temperatures. The ABV varies from 3.5% to 5.3%. 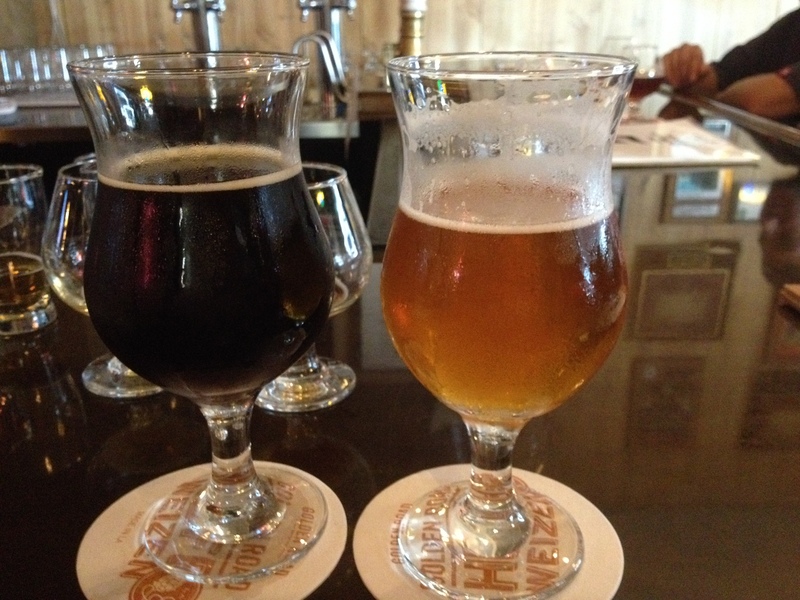 I could give you the Beer advocate talk about aroma and color but that’s not what I do. I explain it like this. It’s stronger tasting than a lager but seriously tastes like Hawaii. Not like some IPAs out there who are brewed with so much stuff you’re drinking a pine forest. 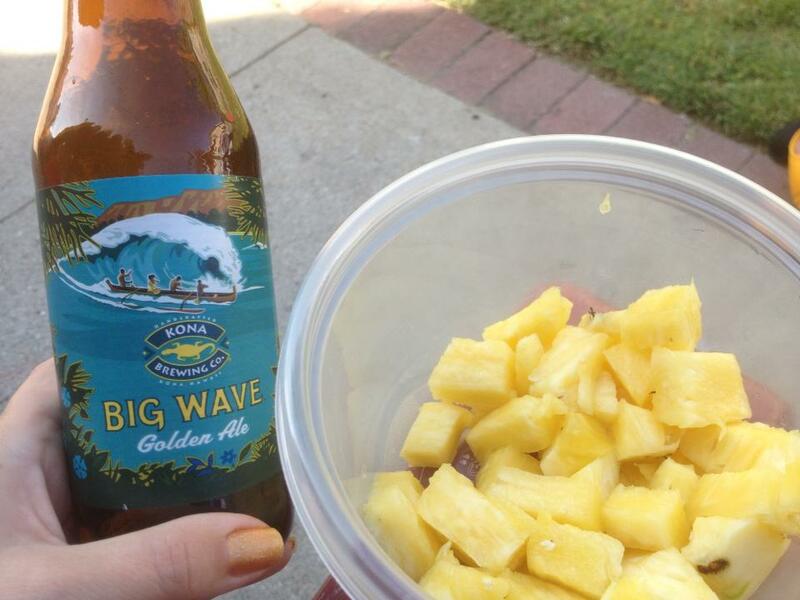 This beer’s flavor meets its promise of a tropical hop flavor. Its my “john” a tiny bit more depth than the very popular and equally as good just more for the masses “paul”. 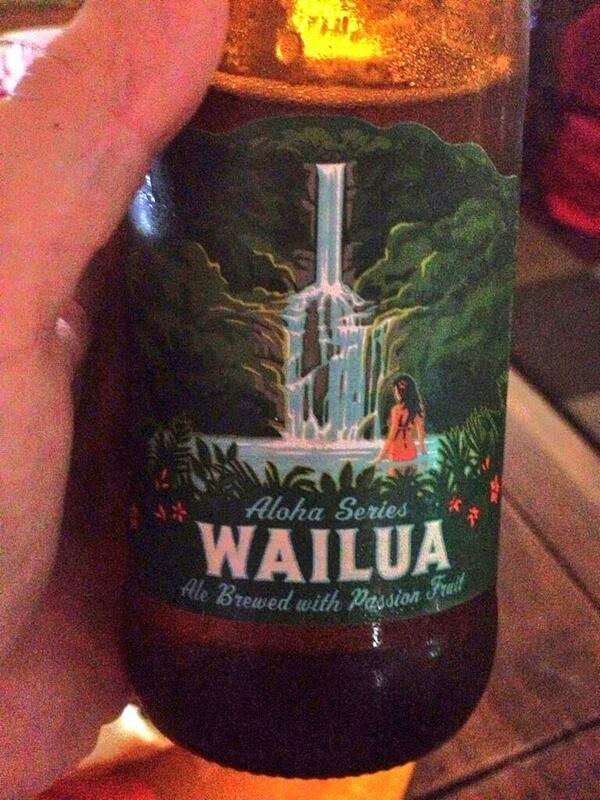 Wailua is the current seasonal brew in the Variety 4 pack of Kona. This one surprised me. Its really refreshing. Also an ale this one is super citrus and tropical tasting but not like a wine cooler citrus this is a beer but its light and perfect for by the pool, or beach if you have one. “George” sometimes forgotten but just as talented..err I mean delicious as the other three. Firerock is the final beer in the Variety Pack. Lets call it our Ringo. Its their Pale Ale. Not a Golden Ale but a Pale Ale. I mentioned in a prior blog that Pales Ales are the gateway beer to IPAs. A Pale Ale is an amber colored ale brewed with pale malts; similar to bitter but drier and lighter. Both the Pale Ale and the IPA were created by British Brewers and both are known for the liberal use of Hops! As the Pale Ale evolved in the late 18th century, it became necessary for an ale to be brewed that could survive the long trip from the UK to India. So a batch of Pale Ale was brewed a little but stronger more hops. And thus the India Pale Ale or IPA was created. Pale Ales have a slightly less hop profile, the IPA is full blown Hoppy hop hop …Pale Ales typically contain 3.8-6.2% ABV the IPA is more aggressive 4.5-12% or I assume even higher! Im not a huge fan of the IPA. 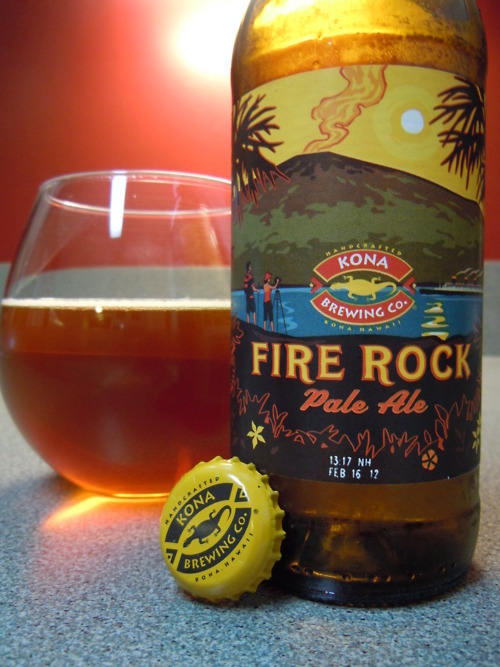 Im not a hoppy hop hop girl and I like my beer in the lower ABV range so this Firerock is great. Pale Ales are the way to go if you want to slowly get your hop on. I do have to do a quick shout out to the Koko Brown which is avail in the Variety Pack in Spring and winter. This is another great beer its an America Brown think Newcastle, Sam Adams type but its brewed with real toasted coconut. We’ll discuss more in the winter months. Kona Brewing Company’s Pipeline Porter is making its way to the Midwestern states of Ohio, Illinois, Missouri, Indiana and Minnesota for the first time this September. Part of Kona Brewing’s Aloha Series, this American Porter is brewed with freshly roasted Kona coffee from the Cornwell Estate Coffee plantation neighboring Kona Brewing on the Big Island. 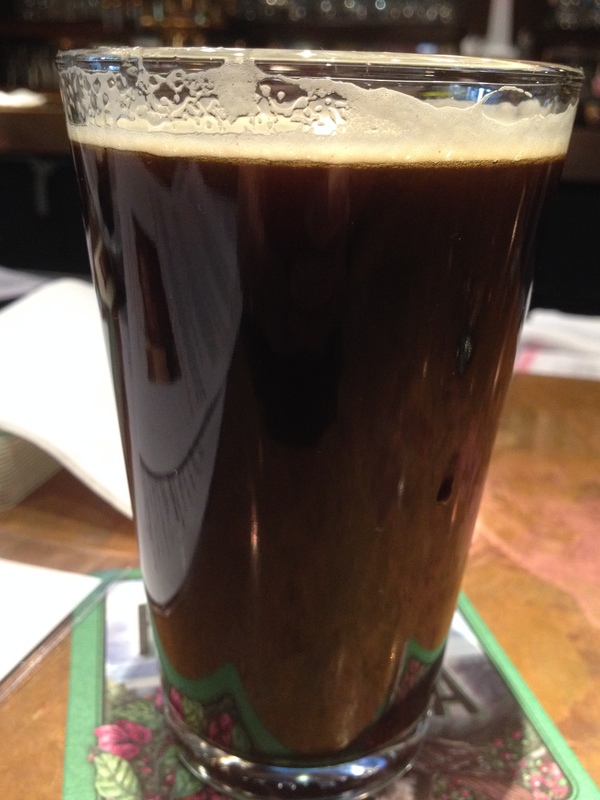 Served year-round in Hawaii, Pipeline Porter has 5.3% ABV and an IBU of 23. I have a friend who’s getting me some so I will review this one as soon as I finish my first one. Which will be about 4 min after I get it! 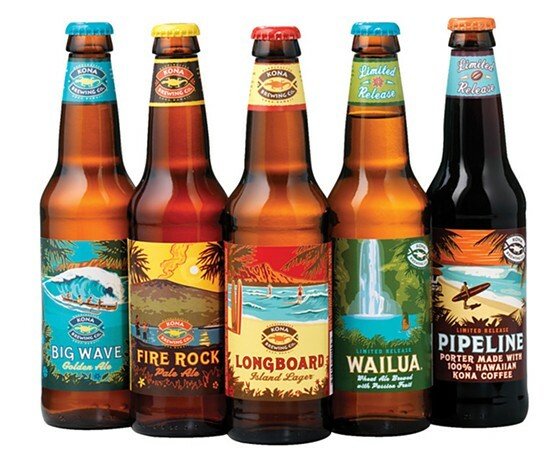 Mr Beerman and I will be taking a trip to http://konabrewingco.com/pubs/koko-marina-pub/ in 8 weeks and 6 days but who’s counting. I plan to try everything they have x 2 and bring you a full report back from Oahu!! Stay tuned!